Select the table > Enter ModelNamespace > Finish. In above method, we are using Delta<DocInfo> type argument instead of DocInfo. 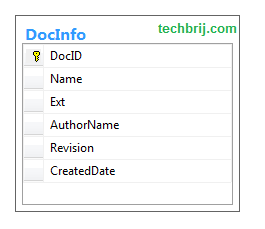 Delta<DocInfo> allows to set any DocInfo property and also track which properties are set. Delta class provides Patch method which copies the properties that have been set. Note: oData 0.2.0 alpha is used. It may be subject to change. You can get new nuget package for building OData. We are going to update only Revision property for a particular document. For simplicity, we are taking same app to consume web API and using following ajax method in the view. It will update Revision to 2 for DocID = 1. This isn’t working for me. the ajax request, when viewed via the Network tab in the F12 developer tools, shows no request body (maybe a limitation of IE 11, I do see the PATCH request body in Firefox dev tools). Either way, the `delta` is not recognized / de-serialized as a controller parameter on the server. I can check the fields against Null, if they r null I forget about them. Right? what s the point of using Patch then?